BABY CORN COOKED IN RICH TOMATO GRAVY. Last week when we all went to a North Indian restaurant for lunch we ordered a Baby Corn Masala which we have never tried before in that place. We all liked it very much and we went for veggies shopping and my daughter picked the cute baby corns in the vegetable section and asked me to make a masala with that. I tried to recreate the same taste but i almost it was like that(my daughter said) and we had a great dinner with rotis and a salad. Wash the Baby corn and cut them into big pieces. Pressure cook this by adding little salt and keep it aside. In a pan add 2 tsp of oil. Roughly chop the 1 onion and capsicum saute them in a pan till it turns into a nice brown colour. Roughly chop the other 2 onions and peel the skin of garlic. Add 2 tsp oil in a pan and add the onions and garlic. Cook till golden brown. Switch off the flame and add the cashew nuts, tomatoes(roughly chop), red chili powder, coriander powder, kasoori methi, tomato ketchup and garam masala (if adding). Allow these to completely cool. Add all these into a mixie jar and grind it into a smooth paste. Add oil in a pan and add the ground masala. Saute for 2-3 minutes in a low flame. Add in the cooked baby corn. Add little water to adjust the consistency. Add milk to this. If adding fresh cream add 1/4 cup of fresh cream. Now add the capsicum and onions to this. Serve it hot with Roti/ Naan. It tasted even so yum with Peas pulao also. Tomatoes can be replaced by 1/2 cup of store bought tomato puree. Fresh cream can be replaced by milk. Instead of baby corn you can add paneer and make it panee masala. Any colour of the capsicum can be added. 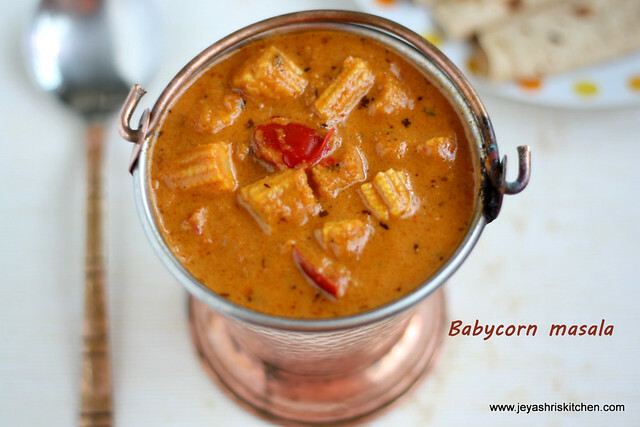 Yumm, babycorn masala looks truly delectable and fantastic..
Love babycorn a lot...looks really yumm nnice combo wid rotis..
Super recipe...looks very tasty and like restaurant dish. Rich & delicious gravy!!!!! A keeper for sure :) Hey n i love the vessel too!! Delicious recipe and nice presentation... gonna try this method soon.. This is my all time fav.. Ur container for presentation is really awesome. Nice recipe... YUM! 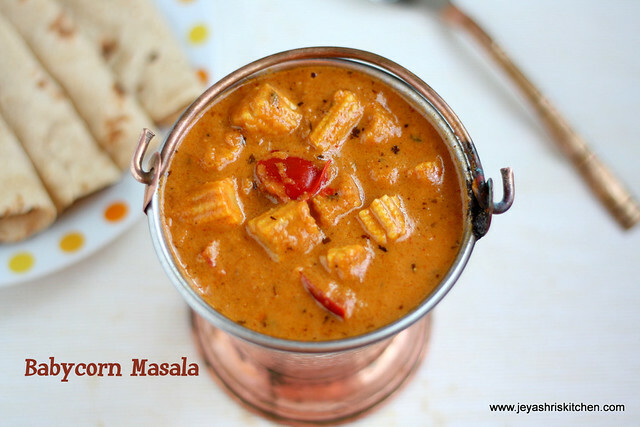 wow baby corn masala looks so creamy and very inviting gravy !! cute vessel !! Awesome Jayasree...Curry looks super delicious..
absolutely delicious - Love the pail in which you've presented! I think ground cashews always elevate gravies... Looks fabulous. yummy and tasty subzi, surely kids will love this. 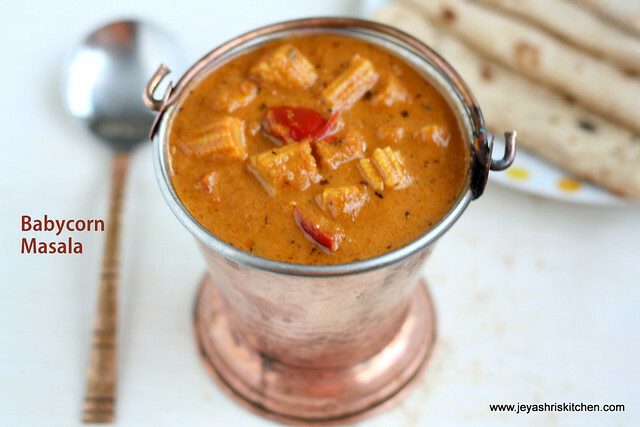 Hi Jeyashree!The gravy looks absolutely delicious and the kutty bucket even more tempting! Love your pictorial presentation! Milk , what type to use. Can we use condensed milk? @rukku, i have used normal full cream milk.condensed milk will be sweet. Lipsmackingly delicious baby corn masala!!! Great pictorials too. LOoks yummilicious jeyashri.. i think i missed few post and got to browse now... looks delicious. homely traditional inviting luk fr a new recipe...superb...nice presentation too..wer do u find all these traditional serving pots..really nice. What a unique way to prepare baby corn! I love it...this looks delicious! first time to your space...Loved the baby corn masala..interesting posts..! can we add ginger garlic paste to this recipe. thank you. Looks yummy :) I've never made babycorn on its own but this recipe sounds delicious, esp when you fry onions n tomatoes and then make a paste...:) Cashews would make it richer too...Thanks for sharing..I will make it sometime. This is such a yummy recipe. I have never made baby corn with gravy this looks delicious. I will try this out! i bought some baby corns for pizza...i don't know what to do with the rest...i prepare this with chapathi...came out very well..excellent..
Tku jeyashri... lukz yum yum,.. wanna try t today !!! tried thos for first time..no words..simply superb..ur recipes rock!! tried it..could not stop eating..all ur recipies Rock!!! I tried this an it is excellent !! Thanks for sharing this recipe Jeyashri! It turned out awesome! Your recipes are great and your pictures drool-worthy! Tried out.came out very well.very excited that forgot to make a click.the next time will post my try. This recipe ingredients serving for how many person?? please let me know right now. Whether to add boiled milk or plain milk. If v add boiled milk na how long to cook? Reg your doubt, you can add either boiled milk or plain milk too. I generally add plain milk. If adding boiled milk just cook for 2 more minutes after adding milk. I made the gravy and it came out very well. Everyone in my family liked it so much. Thanks for sharing! !